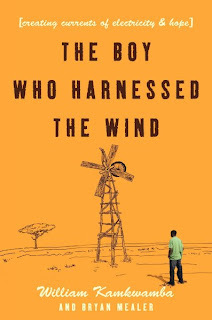 William Kamkwamba's story, The Boy Who Harnessed The Wind , shows the power of books to influence lives. Kamkwamba grew up in Malawi, a country where magic, instead of science, ruled people and their behavior. Poverty, disease and starvation were common among villagers. He dreamed of gaining entrance into one of Malawi's top boarding schools and studying science. Tragically, he could not attend because a famine left his country in trouble. The family farm was left impoverished and his people were left destitute. Kamkwamba's determination led him to accomplish his dream. He studied independently now that he could no longer attend school. He spent time studying books on geography, social studies and basic spelling. He began with curiosity, an idea, science books, creativity, as well as a strong drive to do something for his family. Kamkwamba desperately wanted to find a way to bring electricity and water to his village because of droughts. He writes that one book in particular, Malawi Junior Integrated Science book, caught his attention. He found this book in the public library. At the age of 14, he used scraps of metal, tractor parts and bicycle parts to build a windmill that would bring electricity and running water to his village. Later, he even built a second windmill that brings water to the village from a deep well. His story is truly inspiring. I enjoyed reading about the culture and customs common to the people of Malawi. I admire his determination and strength of spirit in such tragic circumstances. Kamkwamba's words tell a beautiful story of courage and strength in the face of adversity. The theme of this book reminds us of the power of books and words to change lives. Thanks to public libraries, we have access to vast collections of books, as well as other materials. We can learn, and are influenced by the thoughts and ideas written by individuals from generations past. Librarians preserve these thoughts and ideas so that we may access their valuable information. Please take advantage of BPL's collection of materials by visiting your local library today. You will learn, grow and be truly inspired by a diversity of materials. Kamkwamba shows us that our dreams are within reach if we are determined to accomplish them. If you check out Kamkwamba's website, he is currently working on a project to rebuild primary schools. 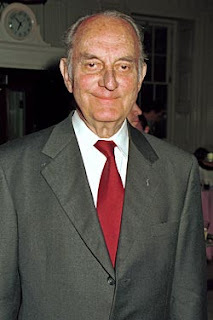 Louis Stanton Auchincloss died Tuesday, January, 26 at age 92. He was a highly prolific author of both fiction and nonfiction. James Auchincloss, the author's grandson stated that the author died Tuesday, one week after suffering a stroke. Louis Auchincloss was born in New York in 1917. His grandmother knew Edith Wharton and his father was a Wall Street lawyer. Auchincloss was the son of privilege and therefore had the background to write novels about upper-class society. He was the son of a highly successful attorney and was able to attend the exclusive Groton School and Yale University. Lawyer and author Louis Stanton Auchincloss was a highly prolific novelist of elite society, including works of social manners and New York's "old-money" aristocracy. In this regard, he succeeded Edith Wharton in penning insightful novels about New York's highly successful. 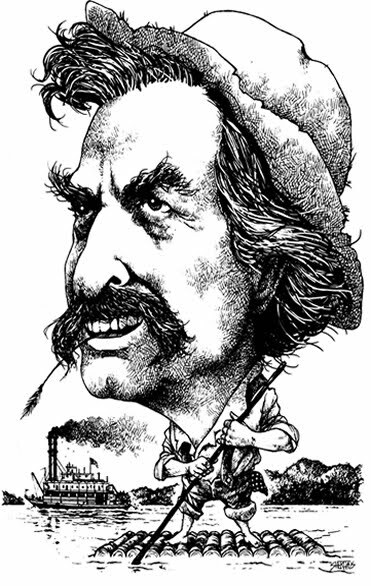 His primary topics for novels were manners, family, money and marriages, as well as the language and arts of New York's upper-class. Reports state that Auchincloss did not praise the elite but attempted to explain their behavior. He also wrote short stories and criticism. Auchincloss wrote over 50 books including The Rector of Justin, the novel that critics regard as one of his best works, as well as the memoir A Writer's Capital. He was also a four time fiction finalist for the National Book Award, including the nominated The House of Five Talents and The Embezzler. Auchincloss also wrote numerous other works including biographies, literary criticisms and short stories. Many of Auchincloss' novels are multigenerational. According to the New York Herald Tribune Book Review contributor E.C Dunn, The House of Five Talents was "the story of human beings, their complexity, [and] their insecurity." The story describes an "original middle-class New York family from 1873 to 1948, from a social-climbing grandfather to his heiress granddaughter." Granville Hicks, from the Saturday Review, said that Auchincloss in Portrait in Brownstone "tells the story in a neat, dry style that repeatedly gives great pleasure." Auchincloss continued to contribute to society and adhere to certain ideals by being a writer, attorney, community leader and family man. He was a partner at a Wall Street firm and father of three children. He was a cousin by marriage to Jacqueline Kennedy Onassis. She worked with him when she was a book editor later in life. Jerome David Salinger died at his home on January 27, 2010 in Cornish, New Hampshire. His literary agent announced his death, saying it was of natural causes. His literary talent rested on a small collection of highly influential works including the novel The Catcher in the Rye, the collection Nine Stories, Franny and Zooey, and Raise High the Roof Beam, Carpenters and Seymour: An Introduction. J.D. Salinger was best known for his 1951 novel, The Catcher in the Rye, as well as for his reclusive nature. Catcher was Salinger's most famous and controversial work. This American author gave his last interview in 1980 and published his last original work in 1965. 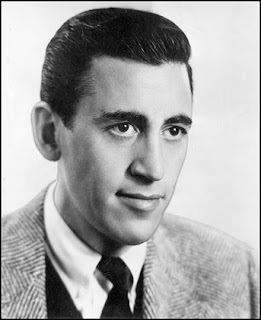 Jerome David Salinger was born in Manhattan on New Year's Day in 1919. He attended a progressive school on the Upper West Side but was never much of a student. Young Salinger reported to the admissions office that his interests were dramatics and tropical fish. After two years he flunked out and was sent to Valley Forge Military Academy. Young Mr. Salinger was said to love attention. He bragged about his literary talents often. As a young writer, Salinger was reportedly a ladies' man and dated many young women including Oona O'Neill, the future wife of Charlie Chaplin. The Catcher in the Rye was a novel about adolescent alienation and loss of innocence. The protagonist, Holden Caulfield, was a teenager newly expelled from prep school. He decides to visit his younger sister Phoebe before going west to live in a log cabin. The cynical voice of Caulfield echoes typical adolescent feelings and critical ideas of society. The novel was highly controversial because of Holden's language and criticism of society. For decades, the book topped the banned books list and conservatives demanded that it be removed from the shelves of libraries and public schools. The novel no longer remains as controversial today because of books with more explicit language. Interestingly , an American Library Association Survey published in 1996 found that The Catcher in the Rye was accessible in almost 99% of libraries that the group surveyed. The novel continues to sell over 250,000 copies a year in paperback and remains widely read. Salinger's last published story, Hapsworth 16, 1924, appeared in The New Yorker in 1965. He received harsh criticism from the reviewers regarding his work. After its publication, Salinger left New York City and permanently moved to his farm in Cornish New Hampshire. He reportedly wanted to escape the "phony" society. Later, there were only rare public sightings of Salinger. The author lived in seclusion for more than 50 years. "A book is a loaded gun in the house next door. Burn it." Ray Bradbury's famous novel about book-burning firemen is a 20th Century classic that needs little introduction, and has in fact become something of a sacred text among librarians. One thing that reading it over again makes clear, though, is that it is not a science-fiction novel about some future dystopian society where reading is supressed by a tyranical government. It's a book about the present, whether that's 1953 or 2010, and the impulse of a lazy, distracted society not just to censor that which is uncomfortable or disagreeable, but to willingly turn a blind eye to the accumulated knowledge of centuries in favor of fast cars, big TVs, and feelings of personal security against a backdrop of constant war. Sound familiar? It seems ironic that Bradbury would authorize a comic book version of his work, seeing that comics were what replaced books in the film based on his novel. 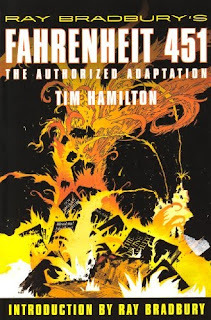 Tim Hamilton's adaptation, however, brings home how close Bradbury's sci-fi tale strikes to the mark, and the parallels between Guy Montag's world and our own become too strong to ignore. From an artistic standpoint, what stands out most in the graphic novel is the use of color, almost exclusively those of late autumn moving into winter, just like the dying society Bradbury depicts. There's not a shred of green to be found, and the use of blue stops with the death of a key character early in the book. After that, there are nothing but muted browns, yellows and orange. And red. Lots and lots of red. Despite all its gloom and fatalism, Fahrenheit 451 ends with a ray of hope. Fire, we are reminded, not only destroys but cleanses and renews. The book concludes with the first hints of the phoenix rising from the ashes of a willfully ignorant society, and reminds us that the main thing books do, the purpose which they serve best of all, is to remember. 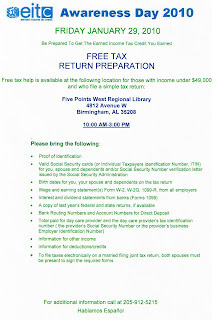 In addition to offering tax forms and assistance, the Birmingham Public Library is hosting EITC (Earned Income Tax Credit) Awareness Day 2010. 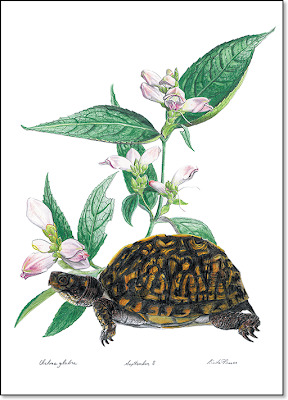 Take a walk through the calendar year in southeastern wild flowers with botanical artist Linda Fraser. Her paintings will be on view in Central's Fourth Floor Gallery from January 5–February 11, 2010. Linda will present a gallery talk in the Fourth Floor Gallery on January 24 at 3:00-5:00 p.m. with a reception to follow. The exhibit, talk, and reception are free and open to the public. For a preview of Fraser's work, visit her Website at http://www.lindafraserartist.com/. 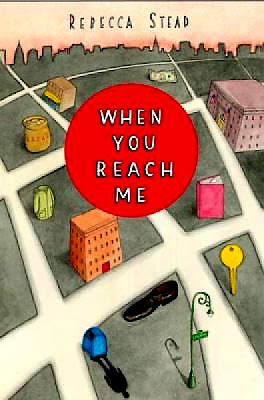 The 2010 Caldecott and Newberry Award winners have been announced. 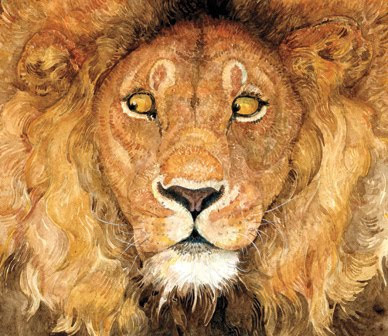 The Lion & the Mouse by Jerry Pinkney won the Caldecott and When You Reach Me by Rebbecca Stead won the Newberry. Visit the Kids Catalog for links to these winning children's books. The Birmingham Art Music Alliance is an autonomous nonprofit organization with the twofold mission of promoting music by Alabama composers and presenting concerts of recently created art music to communities in Birmingham and beyond. Members include local composers, professional performers, students, and enthusiasts who wish to preserve and maintain the long tradition of music as a living art form. Join us for a performance by members of this talented group. Wednesday, January 27, noon. Erich Segal, author of the incredibly popular 1970 novel, Love Story, died January 17 of a heart attack at his home in London. He had battled Parkinson's disease for 25 years. His funeral services were held in London on Tuesday, January 19. 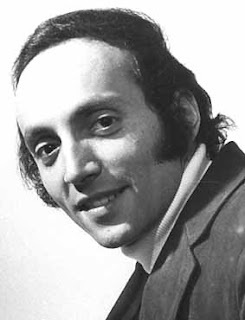 Erich Segal was born in Brooklyn, New York in 1937, and was the son of a Rabbi. Erich studied languages, including Hebrew, at an early age and became fluent in German,, French, Latin and Greek. He graduated from Harvard in 1959 with a masters in classics, and in 1965 with a doctorate in comparative literature. Mr. Segal taught Greek and Roman Literature at Yale University, as well as classics at Princeton and Dartmouth. His classes were among the most popular at Yale, reportedly drew large crowds and were rated top performances by his students. His first screenplay was the highly successful Yellow Submarine. He collaborated with the Beatles to create the animated 1968 Beatles film Yellow Submarine while publishing Greek tragedy and Latin poetry. Erich Segal's first novel, Love Story, was published in 1970, and was about a young couple who fall in love, marry, and later discover that she is dying of cancer. The story was originally written as a screenplay about the love between a working-class Italian girl from Radcliffe and a Harvard boy. The 1970 film which starred Ali MacGraw and Ryan O'Neal was a huge hit. The film was already in production before Segal reworked it as a novel. The first paperback run of Love Story, according to Robert Thomas, Jr. from the New York Times Book Review, "produced the largest initial print order in the history of publishing [up until that time], 4,350,000" copies. Segal's novel was the best-selling book on the New York Times Book Review for a year, sold eleven million copies in the United States, and was also translated into twenty-three languages.. The Love Story line - "Love means never having to say you're sorry"- became a famous national phrase. Erich Segal never obtained the same level of success he had with Love Story. His later novels including Oliver's Story, Man, Woman and Child, The Class, and Doctors were bestsellers. Several books were made into movies. Segal is survived by his wife Karen James and daughters Francesca and Miranda. Erich Segal will be missed. 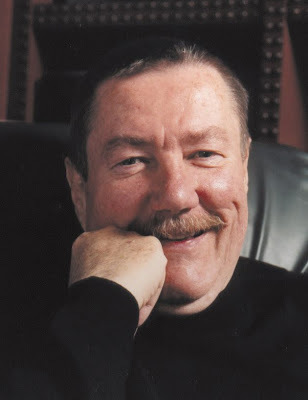 Robert B. Parker died Monday in his home while sitting at his desk. He was 77. One critic described Parker as "the best American hard-boiled detective fiction since Ross MacDonald and Raymond Chandler." Although Parker wrote four different detective series, he is most famous for the "Spenser" series about a Boston detective who solves crimes while surrounding himself with colorful characters. Parker was going to name his detective David Spenser, but didn't want to make his other son feel left out so Spenser's given name is not revealed. Parker's wife, whom he met when they were toddlers at a birthday party, was a major influence in his life. Together they created a film company based in Boston, and they shared a nomination for best script for their collaboration on B.L. Stryker. His career as novelist didn't begin until Joan urged him to complete his Ph.D. and get a job in the teaching field so he would have more time for his writing. The Godwulf Manuscript, his first Spenser book, was written in two-and-a-half years and accepted by a publisher in just three weeks. He followed The Godwulf Manuscript with 37 more Spenser books. Parker's other series include the Jesse Stone detective series; the Sunny Randall detective series—a female PI created for actor Helen Hunt to play in a film that never materialized; and the Virgil Cole and Everett Hitch western detective series. As part of the state-wide Big Read, the public libraries of Jefferson County are sponsoring two poetry contests: 1) a Word Up! poetry slam for high school students and 2) a written poetry contest for middle-school students. The Big Read is an initiative of the National Endowment for the Arts designed to restore the importance of reading in American culture. We will be encouraging everyone in the state to read and discuss The Adventures of Tom Sawyer by Mark Twain. The Word Up! poetry slam deadline has passed, but there is still time to participate in the written poetry contest. For details on entering the written poetry contest for middle school students (grades 5-8), visit http://www.jclc.org/services/poetry/BigReadPoetryContestbrochureJeffCo.pdf. The deadline for schools to sign on to participate in the written poetry contest is January 22, 2010. Schools wishing to participate in the contests should call 226-3670 or e-mail Haruyo Myagawa at hm@bham.lib.al.us by the designated dates. Good luck, students! 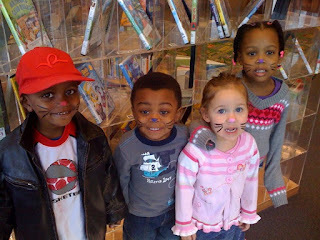 Children say "Meow" after getting their faces painted during the Cat Tales storytime at Springville Road Library. Join us for Hoo-ray for Storytime every Wednesday morning at 10. 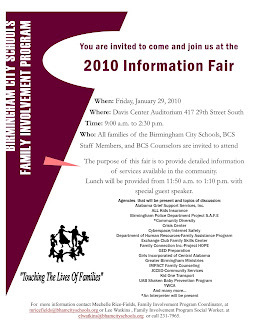 You are invited to come and join us at the 2010 Information Fair. The purpose of this fair is to provide detailed information of services available in the community. Lunch will be provided from 11:50 a.m. to 1:10 p.m. with a special guest speaker. Alabama Grief Support Services, Inc.
For more information contact Mechelle Rice-Fields, Family Involvement Program Coordinator, atmricefields@bhamcityschools.org or Lee Watkins, Family Involvement Program Social Worker, atelwatkins@bhamcityschools.org or call 231-7965. 1) Do you believe a generational gap is impeding Birmingham's progress in the arenas of education, government and politics, religion and spirituality, business, and civic life? 2) What strategies or models should local leaders, including youth leaders, employ to foster intergenerational cooperation, mentoring, and shared governance? Members of the panel will draw on their respective initiatives and accomplishments to respond to these questions. 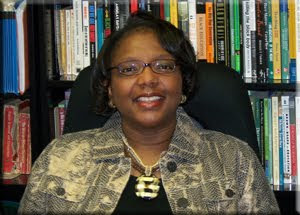 Dr. Tondra Loder-Jackson, Associate Professor at UAB’s School of Education, will moderate the panel. The Library will provide light refreshments. 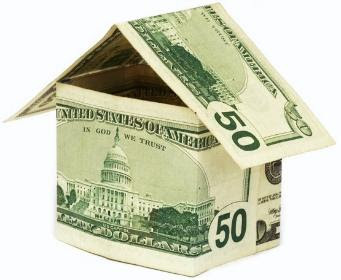 Have you ever heard of a reverse mortgage? Do you know what one really is? Join us for a look at the facts about how these mortgages work and how they might be a possible alternative for older adults. Wednesday, January 20, noon. 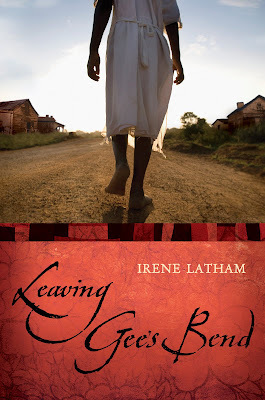 Leaving Gee's Bend, by Alabama author Irene Latham, is a touching tale, set in 1932, of Ludelphia Bennett, a young girl who lives in the small African-American sharecropping community of Gee's Bend, Alabama. The community of Gee's Bend is filled with strength, dignity and spirit. Some residents believe in superstitions and some even believe that witches live in Gee's Bend. Ludelphia is blind in one eye but discovers that she can completely forget about the world when she quilts. In fact, wherever she goes, she sees colors and fabrics that she can use in quilts. Her mother is very sick so Ludelphia decides to travel forty miles from Gee's Bend to a community for a doctor's help. During her travels, she finds that life is completely different from life in the isolated Gee's Bend community. She rides in a car for the first time, drinks soda pop and meets different people. Ludelphia learns that faith, love and determination can allow you to accomplish more than you think. I enjoyed reading this novel because of Ludelphia's spirit and her love of family and community. You will learn some interesting history about life in Gee's Bend. To reserve a copy visit the JCLC Encore catalog. Irene Latham will be at the Central Library on March 9 to talk about the challenges of writing Leaving Gee's Bend and to sign copies of her book. To learn more about Gee's Bend, Alabama please take a look at the following resources. You will need a JCLC Library Card to access the databases. The Foundation Center is the leading authority on connecting grant-seeking nonprofit organizations with philanthropic institutions and providing them with tools they can use and information they can trust. Established in 1956, the Foundation Center supports a nationwide network of Cooperating Collections, such as the one at Birmingham Public Library, that provide under-resourced populations with the tools and training needed to connect with those willing to provide funding for their endeavors. What is BPL’s Cooperating Collection? The Cooperating Collection, located in the Government Documents Department at the Central Library, provides free public access to grantmaker directories, books on fundraising, and information on managing nonprofit organizations. Also available is free access to the Foundation Directory Online, which contains more than 99,000 profiles of grantmakers, 1.6 million records of recently awarded grants, and much more. Trained staff are available to help searchers make the best use of the collection’s resources. What can the Cooperating Collection do for you? If you work for or represent a nonprofit organization, the Foundation Center and BPL’s Cooperating Collection offer a variety of paths to furthering your organization’s goals and identifying sources of potential revenue. The Library gives free quarterly orientations on how to use the Center’s resources, the next of which will be on February 16 from 9:30 to 11:00 a.m. A special presentation by Joanne Kepics of the Atlanta Foundation Center will be given on March 1 from 2:00 to 3:30 p.m. in the Richard Arrington Auditorium. These programs are free, but registration is required as space is limited. The Government Documents Department is located on the 3rd floor of the Central Library’s Linn-Henley Building and can be reached at (205) 226-3620 or at gov@bham.lib.al.us. The Cooperating Collection may be accessed at any time during the library’s regular business hours. 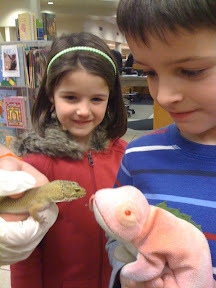 Walker Cole shows his "pet" chameleon to Gizmo the Leopard Gecko during Grub Down at Springville Road Library. His sister Maggie looks on. During the program, children learn about the animals, watch the staff feed them, and even pet the animals. Grub Down is held every Tuesday at 4 p.m. in the Springville Road Library Children's Department. My son is in the mischievous and stubborn stage, so it's no surprise that he has fallen in love with a fat, yellow cat who rules the pages of Chester with a touch of sass and a red Magic Marker. Chester is self-centered and likes to take credit for work he didn't do. When it's as easy as marking out someone's name, why not? Melanie Watt begins her book about an unassuming little mouse with: "Once upon a time there was a mouse. He lived in a house in the country." But then Chester starts marking up the page: "Then the Mouse packed his bags and went on a trip very, very far away and we never saw him again!" He even draws a circle around Mouse, attaches him by dashes to an airplane, and sends him out of the country. "Hasta la vista, Mousie!" While Mouse is away, Chester takes over his home, labeling things with "MY curtains" and "Chester's chair" and drawing cat ancestors over Mouse's family photos. When Mouse returns from his trip to Mexico, the story tries to soldier on but Chester keeps blocking the frame of the page with his yellow bulk. His jealousy is so all-consuming that he even tries to end the story in the middle of the book. Finally Melanie gives up and Chester gets his own story...at an embarrassing expense. Books that make kids giggle are to be treasured, so hang on to them when you discover them. 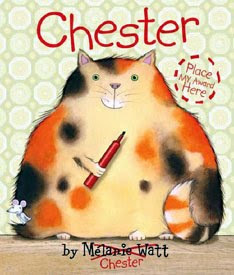 Your kid will get a kick out of following all of Chester's red vandalism on the pages and covers of the book. We've been reading this book for over a year and even now when my son sees red lettering he yells, "Mama! Chester done this!" About the author: Melanie Watt was born in Trois-Rivières, Quebec, where she attended French language school, but then had to hurry up and learn English when her father was transferred to Calgary. She moved around a lot when she was young, and drawing pictures on the hands of children allowed her to break the ice and make new friends wherever she went. She loved drawing Garfield and little animals in general. In college she was going to major in business administration, until she found out numbers didn't hold her interest. So she took up graphic design. Her first book was Leon the Chameleon, published in 2001. 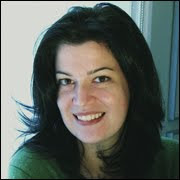 She has since written 11 books, including Chester's Back and the popular Scaredy Squirrel, Scaredy Squirrel Makes a Friend, Scaredy Squirrel at the Beach, and Scaredy Squirrel at Night, published in 2009. Professional catalogers are important to libraries. They’re responsible for assigning subject headings to all materials so that when you search for “resumes” on the catalog, up pops a list of resume books and media. But if you’ve ever thought to yourself, “Hmmm, I would have used this word to describe that item,” well, now you can. A new feature in Encore allows community tagging for every item in the catalog. For example, for a book as big as Stephen King’s The Stand, “biological warfare” is the sole subject heading listed. But readers of this dystopian tome know there’s more to The Stand than biological warfare. So I clicked on ‘add community tag” and added all the words I thought people might use to hunt for this book: captain trips, dystopian fiction, good vs. evil, mother abagail, randall flagg, super flu, the dark man, the walkin’ dude, the free zone. As a way to highlight the books they’ve read, an Arizona book club has tagged the books with the name of their group. Staff at a university in Nebraska has tagged a group of resources to promote the Ethics Center on campus and graduate students in biology tagged materials “alien weeds” to simplify research. Over 1/3 of the tags at a California library were added by teens to detail the genres and major plots of their favorite fiction. An Ohio library uses community tags to identify books for certain age groups and to create a virtual display case for specific subjects. We hope you’ll find your own uses for community tags. And if you think that “orange cover” and “upside down dog” will help someone find Mark Haddon’s The Curious Incident of the Dog in the Night Time easier, then tag it! Don’t forget that you can still star-rate materials and write your own reviews. Children and teens are finding the answers and learning about Martin Luther King, Jr.'s life. They are discovering where he was born and when, his most famous words, the law that he worked to pass and many other facts. All who complete the hunt are eligible to win a book about King's life. Here at Smithfield Library is the winner of Martin's Big Words by Doreen Rappaport. Visit your Birmingham Public Library local branch and join in the fun. The scavenger hunt ends January 15. Just in case you haven’t heard, the Alabama Crimson Tide won the Citi BCS National Championship game last night by beating Texas 37-21. I don’t know about you, but I think Nick Saban might have something to do with the team’s success. :-) During his first season (2007-08) the team had a regular season record of 6-6. During the 2008-09 regular season, the team finished 12-0. This season, not only did the team go undefeated during the regular season, they won the SEC Championship and the BCS National Championship. To take a team from 6-6 to national champions in three seasons is an amazing feat. Roll Tide! Not only that, the SEC has won the last FOUR national championships: Florida (2006-07), LSU (2007-08), Florida (2008-09), and Alabama (2009-10). I wish Colt McCoy could have played the entire game last night because the sportswriters are already saying that Alabama's win has an asterisk. Well, football is a contact sport and injuries are a part of the game. No one would have given Alabama any sympathy if Mark Ingram had been unable to play. Alabama beat both of the teams who won the last THREE national championships. Don't they deserve credit for being a good team? I certainly wish Colt well in his recovery, but it was a clean hit. He said after the game that he's taken several hits just like it. College football season is officially over, but the NFL Playoffs are about to get underway. The Football Subject Guide is still available for you to find good books to read and follow the news headlines. Stay warm and enjoy the NFL Playoffs. 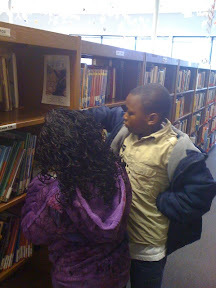 Children hunt down clues for the Martin Luther King Jr. scavenger hunt at Springville Road. After completing the activity, they are given a prize and can submit their names to win a book about Martin Luther King Jr. Drawings for the books will be done on January 15. 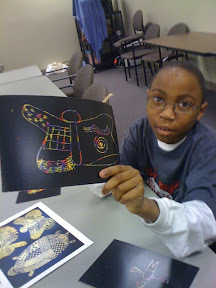 Children use magic color pads to scratch animals and patterns based on "Calabash Cat" by James Rumford. Ig Perrish has lived for years under the suspicion that he murdered his former girlfriend. One day he wakes up with a pair of horns and the ability to force people to tell the thruth, and decides to use his new powers to track down and punish the actual killer. At the famous battle of Little Big Horn, a young Sioux warrior counts coup on the body of the dying General Custer. Afterward, Custer’s spirit haunts the boy for the rest of his life, giving him the ability to see into the past and the future. In this second novel starring shoe designer Valentine Roncalli, the heroine travels to Italy for the wedding of her 80-year-old grandmother. There, she must also deal with her new business partner and falls for a dashing older man. A father’s death reunites a pair of estranged daughters and their Russian-born mother in the countryside of the Pacific Northwest. When Meredith and Nina return home to care for their mother, they must find a way to connect with her and her tragic past. In the sequel to Imperium, Harris continues his tale of ancient Roman intrigue, chronicling the rise of Cicero to the rank of Roman Consul and his confrontation with his chief rival, Julius Caesar. DeLillo’s latest is a tense, haunting examination of two men, one a general involved in planning the invasion of Iraq, now put out to pasture, the other an art-obsessed filmmaker determined to make him the subject of his next project. In Start Over, Finish Rich: 10 Steps to Get You Back on Track in 2010, financial expert David Bach, forecasts that 2010 will be the "Best opportunity for building wealth we have seen in decades... as the economy recovers, you must be set up to recover with it." To place a hold on this new book click here. Join us for a preview of the Symphony’s events scheduled in 2010. The year is full of surprises! Wednesday, January 13, noon. 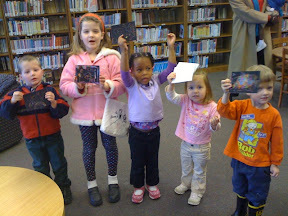 Children hold up their craft work after storytime at the Springville Road Branch. All are welcome to attend every Wednesday at 10 a.m. for "Hoo-ray for Storytime." Beginning Thursday, January 7, at 10 a.m., Springville Road will provide a special weekly storytime for tots. "Mother Goose on the Loose" will introduce nursery rhymes, bounce rhythms, and other activities which promote word recognition. In the tutorial above, viewers are guided in accessing and using Oxford Music Online. Oxford Music Online offers users the ability to access and cross-search the vast resources of Oxford's music reference in one location. The cornerstone of this database is Grove Music Online which provides the full texts of five music reference titles including The New Grove Dictionary of Music and Musicians, 2nd Edition and The Oxford Companion to Music. Oxford Music Online also features the Encyclopedia of Popular Music, a comprehensive reference work devoted exclusively to popular music. Search and browse capabilities allow users to refine their results by source, and specific era or subject category. 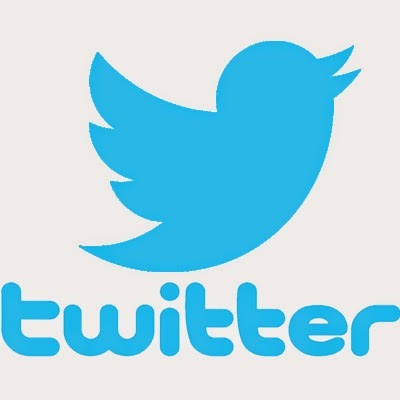 Users can also choose to view biographies, subject entries, or images when searching or browsing. Martin Luther King Jr. Lecture Series Presents "Is a Generational Gap Holding Birmingham Back?" The Birmingham Public Library's Martin Luther King Jr. Lecture Series presents "Is a Generational Gap Holding Birmingham Back?" An intergenerational panel of notable leaders in education, religion, government, business, and civic life will be moderated by Dr. Tondra Loder-Jackson, Associate Professor of Educational Foundations at the University of Alabama at Birmingham. Katie has felt a supernatural presence off and on in her life since she was seven. But she has never been harmed and it’s something she just accepted and lived with. But what would happen if Katie moved in with her boyfriend? And that boyfriend confronted this supernatural presence with a camcorder and a Ouija Board? Are you thinking the presence might become aggravated enough to go beyond slamming a door and knocking Katie’s car keys off the counter? This is the chilling premise of Paranormal Activity, a movie that was filmed in ten days for $15,000 and grossed over 9 million the first week of its US showing. The actors were reportedly paid $500 for their time. After Katie moves in with her boyfriend, Micah, strange occurrences start to happen that can’t be easily explained away. Keys moved to a different spot. Forgetfulness? Noises in the night. The ice maker? Lights flickering. Faulty wiring? Micah doesn’t believe there’s a supernatural presence, but he sets up a camcorder to film what happens while they sleep. But Katie knows her history and calls a psychic, who proceeds to tell her what she doesn’t want to hear. Over the course of a few weeks the presence grows increasingly more bold and violent, and it's all caught on tape. What’s most chilling about Paranormal Activity for me is that this presence is not attached to a house, but to Katie. So she can’t just move away and be free of it; it is always with her. And speaking of houses, this isn’t some crumbling cobwebbed mansion they’re living in, but a modern home furnished courtesy of Kirkland’s in a planned community in sunny San Diego. Horror hits me hardest when it’s dragged into the sunlight. What has Katie the cute English major done to warrant such evil attention? If Katie, why not us? There are two alternate endings to Paranormal Activity, and one idea for an ending too brutal to film. The theatrical ending is the suggestion of Steven Spielberg. I’ve seen all three endings and they got it right on the theatrical release. I implore you not to go hunting around on YouTube for other trailers or alternate endings until you see the movie. The ending comes out of left field and you will jump. The Birmingham Public Library is proud to present Two Suitcases and an Accordion: Traveling with the USO Camp Shows, the January 2010 installment of BPL@Night. Dolores Hydock has been a BPL favorite for years. She has performed at library locations throughout the system on a regular basis. In Two Suitcases and an Accordion, Hydock teams up with Barb Sparkes for a unique musical show that tells of Barb Sparkes' adventures in the USO during World War II. In 1944 and 1945, at the age of 18, Barb Sparkes spent 18 months performing with USO Camp Shows at military bases in the US and abroad. For this special performance, Barb herself, now 83, is on hand to tell about that time and play her original arrangements of wartime standards on the library's grand piano. For a sample of Barb's music, visit the Barb Sparkes page at www.storypower.org. Barb has just released her third CD, which features her original arrangements of 26 favorite songs, including "Sentimental Journey," "White Cliffs of Dover," "Someone to Watch Over Me," and, of course, "I'll Be Seeing You." The CDs are $15 and will be available at the BPL@Night performance. The program is in the fourth-floor auditorium of the Linn-Henley Building. To reach it, go to the third floor of the new library building, cross over to the old building, then take the elevator or stairs up one flight. The library is at 2100 Park Place, at the corner of Richard Arrington, Jr. Blvd., N., and Park Place (between 6th and 8th Avenue North). There's parking in the library's lot. (It's much easier to park there in the evening than it is during the day!) For information or directions, call the library at 226-3742. For information on the arts and entertainment, check out the Birmingham Public Library’s online subject guides at http://www.bplonline.org/virtual/subjects/. 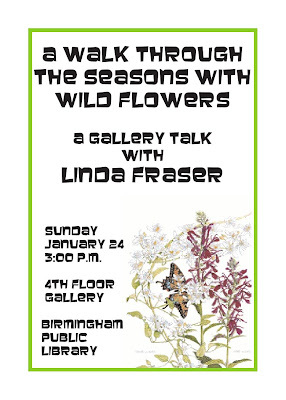 Linda will present a gallery talk in the Fourth Floor Gallery on January 24 at 3:00 p.m. with a reception to follow. In the tutorial above, viewers are guided in accessing and using General OneFile. General OneFile offers millions of full-text magazine articles from a variety of general and specialized journals – from the Christian Science Monitor and the New York Times to refereed academic journals. This database features a variety of multimedia content with images, video, and audio. Street Game, the new GhostWalker novel from New York Times bestselling author Christine Feehan, has just been released. This fast paced tour of Five Points West Library was created by a class of beginning online video makers. The video was recorded, edited, and published during a free public computer class on learning to make short videos. Each student did part of the recording. You may see some of them in the video itself. Interested in free computer training? In the video above, Rosianna reviews books she has checked out, probably once she finished tea. Because that's just what she does.